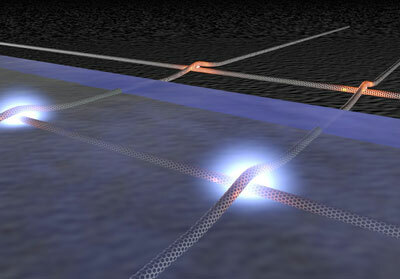 (Nanowerk News) A more effective method for closing gaps in atomically small wires has been developed by University of Illinois researchers, further opening the doors to a new transistor technology. Led by electrical and computer engineering professor Joseph Lyding and graduate student Jae Won Do, the Illinois team published its results in the journal ACS Nano ("Solution-Mediated Selective Nanosoldering of Carbon Nanotube Junctions for Improved Device Performance"). Silicon-based transistors have been the foundation of modern electronics for more than half a century, allowing for the precise control of electronic signals throughout circuits. 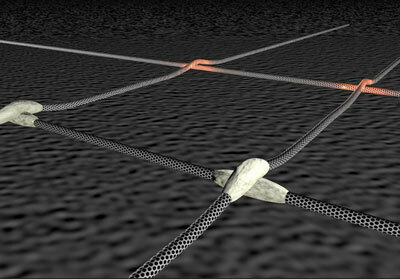 A new transistor technology, carbon nanotube wires, shows promise in replacing silicon because it can operate ten times as fast and is more flexible – but it has an important gap to cross. The resistance results in heat pooling at the junctions between the tubes, providing researchers with the perfect opportunity to “solder” these connections using a material that reacts with heat to deposit metal across the junctions. Once the current runs through, the deposited metal reduces the junction resistance, effectively stopping the energy loss. Until now, the problem has been finding a realizable approach to applying the heat-reactive materials. In 2013, Lyding and Do used a vacuum chamber to apply a gaseous chemical to metallize the junctions. The new technique, the subject of the new paper, takes a different route by applying a thin layer of solution, made from compounds that contain the metal needed to solder the junctions together. To expand the technique to encompass more materials, Lyding’s group teamed with Eric Pop, an adjunct professor of electrical and computer engineering at the U. of I. and an expert on carbon nanotube synthesis and transfer, as well as with chemistry professor Greg Girolami. Do said the new technique is transferable to the current manufacturing equipment silicon transistor manufacturers are using. The next step for the team is to start looking at compounds for the junctions that help to amplify the current even more. “Now that we see this effect, how do we get to the next level? How do we improve by another order of magnitude? We’re advancing this work as we speak, with chemicals that have been synthesized specifically for speed,” Lyding said.